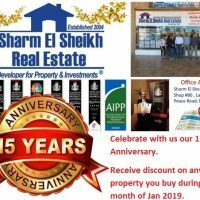 This month, we celebrate 15 years of serving the Real Estate sector in Sharm El Sheikh. Visit us now to learn more about our special offers for this event and get discounts on any property you buy during the month of Jan 2019. Sharm El Sheikh Real Estate, Experts in Real Estate filed covering the territory of Egypt in general, South Sinai area in specific, established 2004. Properties award winners Best real estate in Egypt 2007 - 2011. Participating for over 15 years in the development of the real estate sector and proving free consultant for investors looking to own properties in the premium resort Sharm El Sheikh. From 10 am to 6 pm - Friday off.